Wild horses in North America disappeared about 10,000 years ago, as humans made their appearance. Most wild horses found today are descendants of horses brought to North America by Spanish settlers. 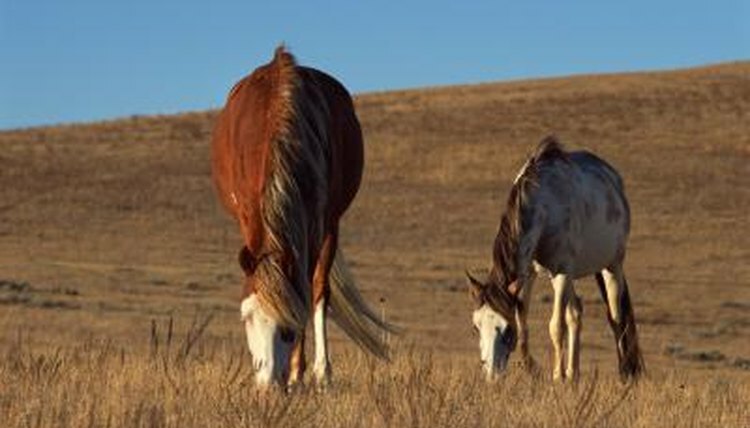 Western states host the majority of wild horse populations. However, some wild horse bands exist in eastern states, managed by nonprofit organizations. Wild horses roam in Georgia, Kentucky, Mississippi, Tennessee, Florida, Maryland, Virginia and the beaches of North Carolina. Kentucky is known for its Kentucky Horse Park. Corova's wild horses are located in Corolla, N.C. Cross Plains, Tenn., has the only adoption center in the eastern United States that auctions wild horses gathered in western states. The famous Chincoteague ponies are found on Assateague Island, with one herd in Maryland and one in Virginia. Wild horses are found in California, Oregon, Utah, Nevada, Wyoming, Colorado, Montana, South Dakota, Arizona and Texas. Nevada is home to more than half of the wild horse populations in North America. Oregon's wild horse populations increase 20 percent every year and are appreciated for their high quality and color. Texas is known for its Oracoke wild ponies. The Chincoteague ponies are unique among wild horses. Feral horses descended from domestics, it's believed they arrived on Assateague Island by swimming ashore after a shipwreck. The herd on the Maryland side of the island is managed by the National Parks Service. The Chincoteague volunteer fire company owns the herd on the Virginia side. A special use permit issued by Fish and Wildlife allows them to graze in the Chincoteague National Wildlife Refuge. The Bureau of Land Management became responsible for most of North America's wild horses and burros that live on public range lands in 1971. The bureau controls overpopulation by operating public auctions of horses and burros, including the adoption center in Cross Plains, Tenn. More than 33,000 wild horses are in the bureau's custody, living on public lands and wildlife refuges.